What factors led to the creation of the French Foreign Legion? One of the best-known fighting forces in the world is the French Foreign Legion. The unit is a very distinctive and is regarded as an elite fighting force. It is also one of the last remaining mercenary forces in the world alongside the Gurkha regiments in the British army. The French Foreign Legion has been portrayed in countless movies and books and as a result. The Legion has participated in every major conflict that France has fought since 1830 and its soldiers have always fought with distinction. The Legion was well regarded by many military experts and served as model for other nations, including Spain. Why was the French Foreign Legion created? Why did the French Empire need a unique mercenary fighting force? Why did France create a unique mercenary unit to fill this role? The French Foreign Legion was created by King Louis Philippe, in 1831 from the foreign regiments of the Kingdom of France. The first recruits came from a variety of countries and it originally consisted of one regiment. The Royal Ordinance for the establishment of the new regiment stated that the regiment was to be composed only of foreigners and they should only serve outside of the Kingdom of France. This was only a temporary measure, but the French elite was soon to recognize the advantages of having a force of mercenaries in their army. 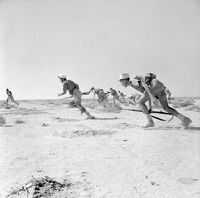 The first French Foreign Legion regiment was dispatched to Algeria. France had recently begun the conquest of Algeria and the Legion were to play a pivotal role in the conquest of that country. The Legion later saw service in the Spanish civil war (Carlist War) and the legion proved very effective, but the regiment was nearly decimated. The French King re-established the Legion and added another regiment. From then on, the French Foreign Legion was used in every foreign conflict waged by France. The Legion fought in the Crimean War and were instrumental in the defeat of the Russians. In the 1860s Emperor Napoleon III ordered the Legion to Mexico in his efforts to add that Republic to his Empire. It was here that the Legion really established its reputation. The legionnaires fought to the last man at the Battle of Puebla and this cemented the reputation of the Legion as an elite force. In 1867, the Emperor recalled the Legion from Mexico and it fought in the Franco-Prussian War (1870-1871). In the aftermath of the French defeat in that war, the new Republican government decided to expand the French Empire. In this period the French Foreign Legion was instrumental in expanding the Empire in Africa and South-East Asia. The French Foreign Legion’s headquarters were in Algeria and this was regarded as the base of the regiments. In the 1914-18 war, Legionnaires fought in the trenches of WWI and saw actions at Verdun and the Somme. In the aftermath of WWI, the Legion fought in Morocco and helped in the conquest of that Kingdom. During WWII the Legion was based in Algeria when the Germans invaded France and defeated the French army. The Legion was divided between those who supported the Collaborationist Vichy regime and those who supported the Free French under Charles De Gaulle. By 1944 the Legion’s regiments were loyal to De Gaulle and fought for the liberation of France. In the post-war period, the Legion was at the forefront of efforts to preserve the French Empire. From 1945-1954 the Legion fought in Indo-China. Its ranks were swelled by former German soldiers who had served in the army; many of whom were former SS men. The Legion was part of the French force that was defeated at Dien Bien Phu (1954) by the Communist Vietnamese during which it suffered heavy casualties. After withdrawing from Indo-China the Legion was next involved in a counter-insurgency in its base-Algeria. During the Algerian War, the Legion was a very effective counter-insurgency force but it was also accused of gross human rights abuses. When De Gaulle began to consider withdrawal from Algeria, many French colonists and soldiers violently resisted his proposals. The Legion was on the verge of mutiny in Algeria and it was also implicated in a proposed coup aimed at removing De Gaulle. In 1962 when De Gaulle ordered French forces to leave Algeria it seemed that the days of the Legion were numbered. 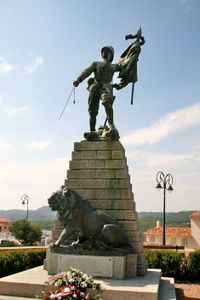 However, the Legion was retained and was based on the island of Corsica. 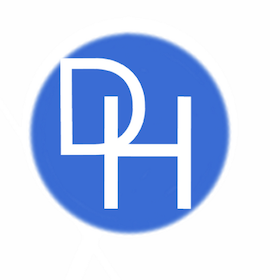 Since the 1960s it has been extensively involved in peacekeeping and nation-building operation in France’s former African colonies. The regiments also served in the First Gulf War and in Afghanistan. At present, the regiment is engaged in operations in the Sahara aimed at Islamic terrorist networks. The organization and the nature of the Legion have changed very little since 1831. The French Foreign Legion, (French Légion étrangère), originally consisted of foreign volunteers. The language of the regiments that comprise the Legion is French. New recruits are all volunteers and they are often refugees or even criminals. The recruits to the Legion undergo a punishing training regime and they are expected to serve for a minimum of five years. The Legion was unique until the end of conscription in France in the early 2000s. The members of the legion were drawn from every nationality, but the officers were mostly French or naturalized French men. The Legion has varied in size throughout its history, but it usually consisted of between two and five regiments. Those who serve in the unit are after their service entitled to citizenship of France. This is because they have ‘shed their blood for France’. The Legion is currently stationed in Corsica, mainland France and French Guiana. Since the Middle Ages the French monarchs had hired mercenaries from all over Europe to serve in their army. There were regiments of Swiss, Spanish, Irish and Scots. These regiments or ‘foreign formations’ were a feature of the French army from, 1300 until the French Revolution. Napoleon was wary of these regiments and he disbanded the Irish regiments who had served in the French army since seventeenth century. However, the Emperor was later to rethink his opposition and he created entire Legions that were composed of foreigners, especially Germans, Poles and Italians. These Legions played a crucial role in the campaigns of Napoleon and they formed a large part of the Grand Armee that invaded Russia in 1812. After the fall of Napoleon, the restored Bourbon monarchy continued the tradition of hiring foreign soldiers. However, after the Revolution of 1830 the French left and liberals were unwilling to see mercenaries in the ranks of the French army. They believed that they could be used by the monarch to suppress French people and to curtail their liberties. This left Louis Phillipe in a quandary as he had many foreigners serving in his army and they would be difficult to replace and furthermore, the king felt that he could not simply dismiss these men who had given loyal service to France. Then after receiving some advice he decided to set up a regiment of foreigners who would serve in the French army and to placate the liberals and radicals he would ordain that this unit would only ever serve outside of the kingdom. The monarch saw this as a temporary expedient that would allow him to continue to use foreign soldiers in his army. However, from this temporary policy the French Foreign Legion was to emerge. The French were very divided between left and right. The French Revolution had resulted in an ideological divide in French society between conservatives and radicals. The country was to remain divided until arguably the 1980s. This meant that any decision by the king or the government was instantly politicized and often resulted in political crises or even instability. Yet France had to fight many wars and many of these were very unpopular. The French public did not like to see the loss of French conscripts in foreign wars. The French Foreign Legion which was composed of foreigners could easily be sent to far-flung battlefields. Their losses and causalities were not a source of controversy and moreover, they helped to keep the native-born French losses in wars to a minimum and this was politically expedient. This was the reasons why after the legion was decimated in the 1830s that it was re-found and reformed. The French high command had a force that could be sent anywhere, and their losses and actions rarely became a source of political debate in the National Assembly or press. This was a key factor in the origin of the Legion and why it is still in existence to this day, despite controversies over its status as a mercenary force and its role in the Algerian War of Independence. 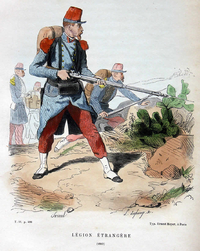 The birth of the French Foreign Legion coincided with the birth of the French colonial Empire. The formation of the unit was a result of the need for the French King to reinforce his troops who were engaged in the pacification of Algeria. The campaign was faltering, and the French monarch was reluctant to sent raw conscripts to fight the warriors of the deserts. The French Foreign Legion was formed to participate in the conquest of Algeria. The regiment played a key role in the pacification of the Arab and Berber tribes. The French king and his successors were very much aware of the suitability of this force for their colonial wars. The Legionnaires valor had surprised many and the French High Command saw the potential in a mercenary force for the various 'dirty wars' that would regularly flare up as the French Empire expanded. The Legion was ideal for these colonial wars as it was made up of desperate men who had nothing to lose and unlike conscripts that had no objection to serving abroad. Often they had no other home than the Legion and this is seen in their motto 'The Legion is our country.' The men who were recruited by the Legion had the incentive to serve as they were being offered the chance of becoming a French citizen and this allowed many of them to escape their often-criminal past. Therefore, they were often happy to be sent to remote postings in the deserts of the Sahara. The Legion was the ideal force for the many colonial wars of the French from the period from 1831-1962. The Legionnaires proved to be one of the key reasons for the expansion and endurance of the colonial French army. Indeed, the Legion still has a presence in the last remaining French overseas possession in French Guinea and Mayotte. The French Foreign Legion is in many ways a relic of a bygone age of Empires, monarchs, and mercenaries. The origins of the Legion were a result of chance as much as planning. It was formed in response to the end of the foreign formations or regiments in the French army. After 1830 the idea of mercenaries serving alongside conscripts was anathema to many French politicians. This led to the creation of a mercenary force that would serve outside force, this was a result of political expediency. Then there was the fact that the French had imperial ambitions and they need manpower for their long-drawn-out and bloody colonial wars. In Algeria the French Foreign Legion proved itself to be immensely suited to pacification programs in remote areas. This persuaded the French government to make the legion a permanent part of the French armed forces. The men of the legion, who were not French were an expendable force and their deaths in battle did not lead to political repercussion or controversy in France. Indeed, the Legion allowed successive French governments to expand their imperial possessions, while limiting the number of conscripts needed to fight in colonial wars.